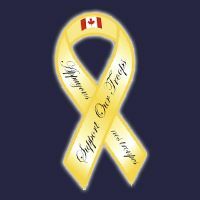 My husband is an Officer in the Canadian Army. This means occasionally he is assigned to a mission that takes him away from home. This is called a deployment. Some training assignments are short, only a few weeks long. Some are much longer and can be up to one year long. These deployments can be very difficult for the family left behind. There is an entire emotional cycle experienced by the spouse/partner that can be quite nerve-wracking and if you add to that the emotional distress of children (even pets) as well as losing someone who helped with many of the household chores – CHAOS ensues! Is your significant other in the military? Does he/she work away from home for long periods of time? Tune into the Army Wife Network on January 10th, 2011 at 20h00 (8pm) Eastern Time and learn how to stay organized before, during and after a deployment! The hardest part I’ve found with deployment (being like my call name says, a Navy wife) is that even though my husband is gone 8 months a year, it’s still not viewed as a “deployment” by most of the support services. Because they go for six weeks, eight weeks, two weeks, two days, one day etc., we are never *off* the deployment cycle, which is incredibly hard. Yet, because they are not gone for a “real deployment”, we – the spouses, children and families at home- don’t get anything in the way of support. The only positive of this kind of continual coming-and-going is that I really can’t- and don’t – rely on my husband for any kind of help with the house, children or anything about his “non-floating” life! Now we face a posting and move while my spouse sails and does his Engineering Officer boards at the same time- so it’s a bit overwhelming at times. I love your blog, and just read the ‘panic early’ post- it helps to know others have survived this too, with senses of humour and love of Rubbermaid bins intact! Thanks for joining in the conversation. I know what short postings are like – CRAZY!!! Sorry you’re not getting much support. Some of the MFRCs have a lot to work on! They’re programs aren’t for everyone. Try just getting some other spouses together for coffee. It helps!